In late October 2012, Hurricane Sandy effectively shut down the A Line commuter train - a critical portion of the New York Transit System originally built around 1890. The hurricane's 5-foot surge went both over and under the track, creating breaches of 120 feet and 270 feet inthe embankment that spans Jamaica Bay. In addition to undermining the track, the surge washed away power and signal equipment, creating a dire emergency for people who use the A Line to commute to work in New York City. 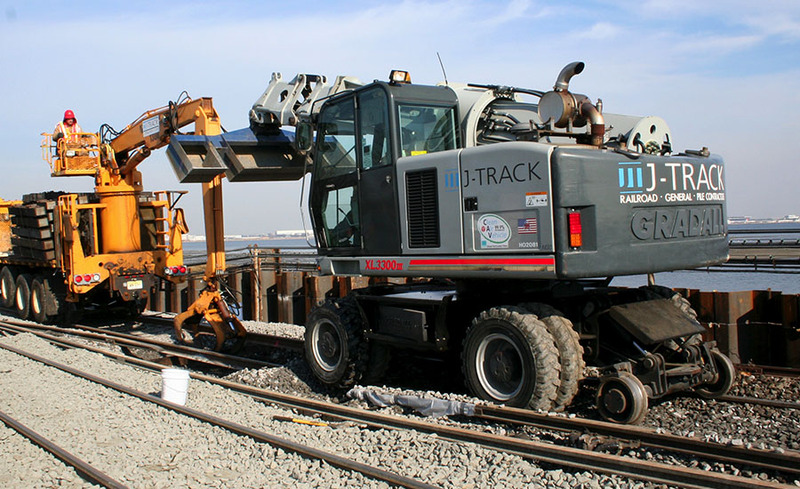 To restore service on the 3.5-mile section, the transit system hired J-Track LLC of Cedar Point, N.Y., known for successful railroad track work, civil construction and architectural work for a number of government agencies engaged in public transportation in the states of New York and New Jersey. Track restoration was completed less than two months after the hurricane struck, starting with the removal of over 3,500 tons of downed trees and debris using a variety of machines. Next, some 2,250 yards of cement was poured to fill the breaches, at some points 12 feet deep, followed by a large quantity of ballast.A Gradall XL 3300 III excavator, designed specifically for railway maintenance, and a truck with a boom and grapple were the primary machines used on the track restoration work. Both were equipped with rail gears, allowing them to move up and down the track quickly. The Gradall was used to loosen old ties, after which the grapple was used to lift them, rotate them 90 degrees and remove them through the rails. The Gradall then smoothed out the grade after which the grapple lowered the new tie and rotated it into position. The Gradall dragged the new tie into the correct location and then spread and smoothed ballast between the rails and on both sides. 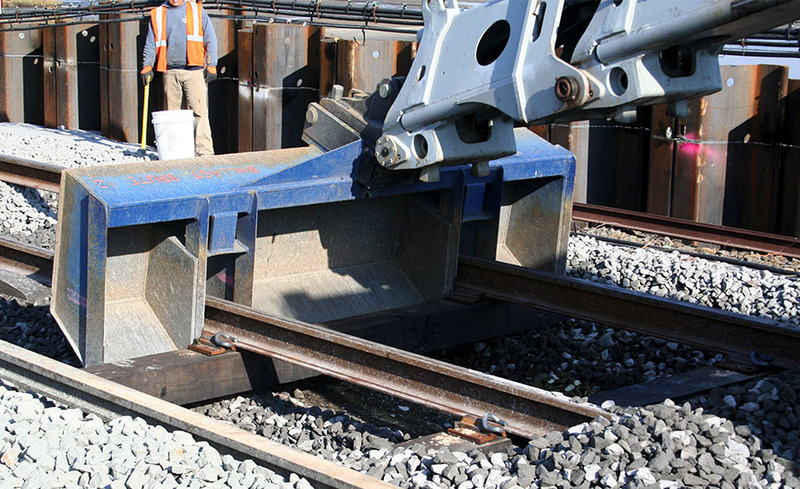 To improve productivity, the Gradall machine was equipped with a special boom-end bucket designed and fabricated by Tommy Sands, track superintendent for J-Track. The 9-foot, 6-inch bucket has two slots that line up perfectly with the track. We use this bucket to reach through the ties to grade the terrain, move the new ties into position and then spread ballast on both sides of both rails, said Sands. The bucket and the smooth Gradall telescoping movements evenly distribute and smooth ballast much faster than if it was spread by hand. The low working profile of the Gradall also allows it to work in tunnels or under structures. "Before we used the Gradall for this type of work, we used manual labor," said Jonathan Barnhart, project manager for J-Track "A team of four men could typically remove and replace 20 ties a day by hand. Using the Gradall and the grapple, we can replace 100 ties a day." 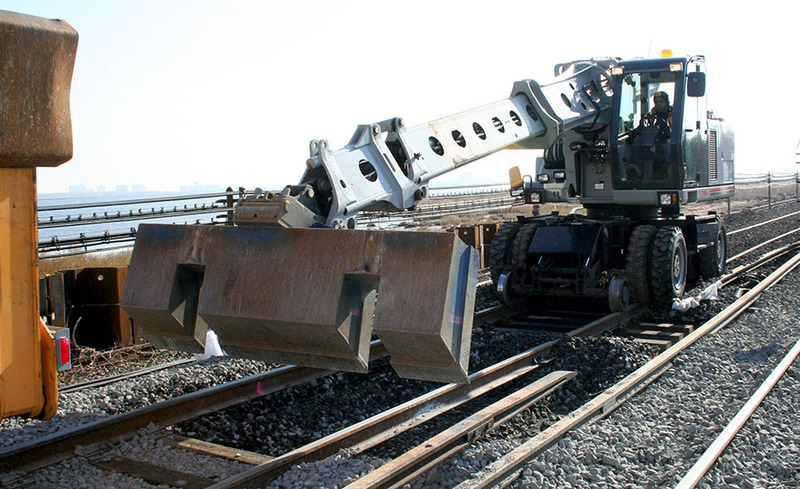 When the XL 3300 isn't being used for track replacement, it's also ideal for other maintenance jobs like repairing crossings and routine maintenance along tracks. "We have a regular bucket we use for jobs like stone removal, ditching work and to spread shoulder ballast," said Barnhart. "The Gradall boom tilt helps us to do a better job sloping and grading stone." Once the A Line track replacement and testing are complete, work will continue to repair switches, signals and other infrastructure - a process that may take a full year.